Costa Rica has been among the world’s premier retirement destinations for decades and this year it won the top spot in International Living’s Annual Global Retirement Index 2018. The editors at Internationalliving.com have drilled down to select the five best expat havens in the land of Pura Vida—each with its own unique flavor. "In the U.S., it seems like you never have the time. Here you feel totally connected to people"
Expats have been flocking to Costa Rica’s Central Valley for decades. With its spring-like climate, central location, and ready-made expat community, it’s not hard to see why. Consistently cool weather is what Costa Rica’s Central Valley is best known for: With the Valley’s altitude of 3,000 to 5,000 feet you can expect temperatures in the 70s F year-round—a climate that’s like few others in the world. Located in the center of the country, surrounded by mountains, it’s close to the capital, San José, making it Costa Rica’s most convenient retirement haven. This convenience means the Central Valley is not the cheapest place to live in Costa Rica, although many expats can still live well on under $2,000 a month. You’ll have everything you need within easy reach. About three to four hours from Costa Rica’s capital, San José, lies the Southern Zone. This region is known for unspoiled seaside wilderness, laidback beach living, and a warm and humid climate at sea level, which gets cooler on the hillsides above the water. The Southern Zone stretches all the way to Panama but most expats are concentrated in and around three main towns. 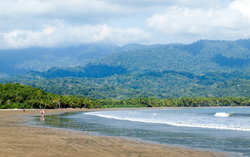 Dominical, a small surf village, is the gateway to the region. Uvita is the commercial hub. Ojochal is a jungle village famed for its gourmet restaurants, which are run by an international cast of expat foodies. Expats here relish the mix of natural beauty and off-the-beaten-path life, yet with modern conveniences at hand. Californian Robby Anderson, 49, started coming to the Southern Zone 25 years ago for surf trips. Over the years, he returned regularly, until eventually he decided to make this his permanent home. Settled by Jamaicans and other Caribbean peoples starting more than 100 years ago, the area still has a strong “island” vibe. And in towns like Manzanillo, you’ll find some of the most stunning beaches in Costa Rica. Businesses are small and locally run. Caribbean-style restaurants offer up spicy chicken and rice cooked with coconut milk for $5 to $6 a plate. Home to both Costa Rica’s largest volcano, Volcán Arenal, and its largest freshwater lake, this area is perfect if you’re after a laidback retirement in a rural setting, surrounded by natural beauty. The area is suited for lovers of the great outdoors of those looking for a small-town vibe. Arenal’s expat community is tightly knit. Doris Luby and her husband Ken, originally from Minnesota, chose Arenal for their retirement for its climate and natural beauty. They now operate an animal rescue center in the area. While $2,000 to $3,000 a month is perfectly reasonable for a retired couple, some expats here report living on less. The Lubys say they are able to maintain a monthly budget under $2,000. That budget includes two vehicles, plus the added expenses of running and operating their animal rescue, as well as the utilities and maintenance of their three-bedroom, two-bathroom home, which they bought for $130,000. If you’re after a warm climate, a healthy lifestyle, and proximity to the beach that won’t cost a fortune, then Costa Rica’s northern Pacific coast and the adjacent Nicoya Peninsula are just the spots. Both of these lie mostly within the province of Guanacaste, where golden sands feed into the Pacific. Here you’ll find the ease and tranquility of beach living with enough modern-day amenities to keep you comfortable. People have been drawn to this area for years for its healthy lifestyle. Residents have a strong sense of purpose, as well as social and family networks that ensure they feel loved well into old age. “Within the first two months, I met more people here than anywhere else I’ve lived,” says New Yorker Sarah Kahi Goitz. She attended a “ladies’ night” for expat women during her first week in the town of Tamarindo. The organized group mirrors many you’ll find within expat communities on the northern Pacific coast. The water has the highest calcium content in the country, helping to strengthen bones. Diets are high in fresh produce and low in processed foods. And a family of four can buy enough fresh produce for a week for about $30. Of course, you won’t have all the conveniences of the Central Valley. But this corner of the country is developing all the time. Despite ongoing development and an influx of tourists to the beaches, living here remains affordable. For most couples, a budget of $2,500 to $3,000 a month will suffice.